I did a genealogical post recently about Henry of Lancaster's grandchildren which seemed to go down rather well, and here's one about some of the grandchildren of Roger Mortimer, lord of Wigmore and first earl of March (25 April 1287 - 29 November 1330) and Joan Geneville (2 February 1286 - 19 October 1356). The couple married in 1301 and had four sons and eight daughters (see Ian Mortimer's The Greatest Traitor for more info): Edmund (the eldest son and Roger's heir), Roger, Geoffrey, John, Margaret (the eldest daughter), Isabella, Joan, Maud, Agnes, Katherine, Beatrice and Blanche. Talking of the latter, here and here are pics of Blanche's stunning effigy in Much Marcle, Herefordshire. Please take a moment to have a look. Isn't she beautiful? Look at the way her gown is made to spill over the edge of the tomb, her hands clutching a rosary, her tight-fitting gown and head-dress in the style of the mid-fourteenth century. Stunning. And here is the effigy of Blanche's sister Katherine and her husband the earl of Warwick, in Warwick. EDIT: Thank you to Ian Mortimer for sending me a photo of the effigy of Roger and Joan's eldest daughter Margaret, Lady Berkeley, in Bristol Cathedral! Son and heir of Roger and Joan's eldest son Edmund, who didn't outlive his father long, dying only a year or so after Roger's execution in November 1330. Roger the younger's mother was Elizabeth, one of the four daughters and co-heirs, following the death of their brother Giles, of Bartholomew, Lord Badlesmere and his wife Margaret de Clare, sister of Maud, Lady Clifford. Elizabeth Mortimer née Badlesmere married as her second husband Edward II's nephew William de Bohun, earl of Northampton, which means that Roger Mortimer, second earl of March and Humphrey de Bohun, earl of Hereford, Essex and Northampton, 1342-1372, were half-brothers. Roger married Philippa Montacute, one of the daughters of Edward III's close friend William, earl of Salisbury (d. 1344), himself the son of Edward II's close friend William Montacute (d. 1319). Philippa's brother, yet another William (1328-1297), was the man whose marriage to Joan 'the Fair Maid' of Kent was famously annulled as she had previously and secretly married his steward Thomas Holland; her sisters included Elizabeth, who married firstly Giles Badlesmere above and secondly Hugh Despenser the Younger's son and heir Hugh (d. 1349; their effigies still exist in Tewkesbury Abbey), and Sybil, who married Sir Edmund Arundel, grandson of Hugh Despenser the Younger and of the earl of Arundel executed in 1326. Edward III restored Roger to his grandfather's controversial earldom of March and arranged the marriage of Roger's heir Edmund to his (Edward III's) granddaughter Philippa, heir of Lionel, duke of Clarence, in the 1350s. Eldest son of Roger and Joan's eldest daughter Margaret (c. 1307/08 - 5 May 1337) and her husband Thomas, Lord Berkeley (1293/97 - 27 October 1361), Edward of Caernarfon's custodian in 1327. According to John Smyth, early seventeenth-century historian of the Berkeley family, Maurice was born sometime late in Edward III's fourth regnal year, which would place his birth around the end of 1330, or about the time that his Mortimer grandfather was executed. When he was still a child in August 1338, Maurice married Hugh Despenser the Younger's youngest child Elizabeth, who was some years his senior, born perhaps in December 1325 when her mother Eleanor de Clare is known to have given birth, or who may have been Hugh's posthumous child and born in late 1326 or 1327. Maurice and Elizabeth had three daughters and four sons; their eldest son and Maurice's heir was Thomas, Lord Berkeley (5 January 1353 - 13 July 1417), father-in-law of Richard Beauchamp, earl of Warwick (see below). Maurice was badly wounded at the battle of Poitiers in September 1356, captured, and held hostage in France until 1360 when his ransom was paid off. He succeeded his father as Lord Berkeley the following year and died on 8 June 1368 supposedly of his old wounds from Poitiers, and had evidently been infirm for some time before that, as he was unable to attend his son Thomas's wedding to Margaret Lisle in November 1367. For more info about Maurice and his wife Elizabeth, see my post. Only child of Roger and Joan's daughter Agnes and her husband Laurence Hastings, earl of Pembroke (1320-1348, only child of Juliana Leyburne, one of my favourite people of the era, and John, Lord Hastings, nephew and co-heir of Aymer de Valence, earl of Pembroke). John's father Laurence died when John was one year and one day old, on 30 August 1348 at the age of twenty-eight; his mother Agnes Mortimer married again, to a knight named John Hakelut, and died in July 1368. John married firstly, in Reading in May 1359 when he was eleven, Edward III and Philippa of Hainault's daughter Margaret - her brother John of Gaunt married Blanche of Lancaster the next day, also at Reading and in the king's presence - who was a year his senior and died suddenly in October 1361, leaving John a fourteen-year-old widower. He married secondly Edward III's cousin Anne Manny, granddaughter and co-heir with her elder half-sister Elizabeth Segrave of Edward II's half-brother Thomas of Brotherton, earl of Norfolk. John died in France in 1375, not yet twenty-eight. By Anne Manny he left a son John, born October/November 1372, who married firstly John of Gaunt's daughter Elizabeth of Lancaster, who was a few years his senior, and secondly Philippa Mortimer, granddaughter of Roger Mortimer, second earl of March and great-granddaughter of Edward III. The younger John was killed jousting at the age of seventeen at Christmas 1389 before the couple had children, and so, sadly, the line of my beloved Juliana Leyburne ended. Second son of Roger and Joan's daughter Katherine and her husband Thomas Beauchamp, earl of Warwick (born in 1314, son of Guy, who abducted Piers Gaveston in 1312), Thomas succeeded his father as earl in 1369 as his elder brother Guy had died in 1360, leaving only daughters. With his allies Thomas of Woodstock, duke of Gloucester, and Richard Fitzalan, earl of Arundel, Thomas was one of the Lords Appellant of Richard II's reign, and was imprisoned by Richard in the Tower of London in 1397, in the tower which still bears his name. Unlike the murdered Gloucester and executed Aundel, however, Thomas Beauchamp did survive Richard's reign. He married Margaret Ferrers, granddaughter of Elizabeth de Clare's daughter Isabella Verdon, and his son and heir Richard was born in January 1381 when Thomas was over fifty; Earl Richard married Elizabeth Berkeley, granddaughter of Maurice Berkeley and Elizabeth Despenser, and secondly Isabel Despenser, great-great-granddaughter and heir of Hugh Despenser the Younger. Thomas Beauchamp was the great-grandfather of Richard III's queen Anne Nevill. Another of the many, fifteen or so, children of Katherine Mortimer and Thomas Beauchamp, earl of Warwick. Philippa married Hugh Stafford, second earl of Stafford, born in the early 1340s as the second son of Ralph Stafford and his abducted wife Margaret Audley, only child and heir of Hugh Audley, earl of Gloucester and Margaret de Clare, countess of Cornwall and Gloucester. Hugh Stafford had an elder brother Ralph, who was betrothed to Henry of Grosmont's daughter Maud but died as a child in 1347, so Hugh became heir to his father and to his grandmother Margaret de Clare's third of the vast inheritance of her late brother. Hugh Stafford and Philippa Beauchamp had eight or nine children, including three earls of Stafford, Edmund, Thomas and William. Their eldest son Ralph, who should have succeeded as earl of Stafford, was murdered in 1385 by Richard II's half-brother John Holland, earl of Huntingdon and later duke of Exeter, and their daughter Margaret married Ralph Nevill, first earl of Westmorland, and was the mother of his first nine children (Henry IV's half-sister Joan Beaufort was the mother of his next fourteen, including Katherine, duchess of Norfolk and Cecily, duchess of York). Philippa and Hugh's daughter Katherine (died 1419) married Michael de la Pole, earl of Suffolk; Katherine's granddaughter Margaret Kerdeston married Jean de Foix, count of Benauges, and it is via this line that Philippa Beauchamp and Hugh Stafford have some remarkably illustrious descendants: Anna Jagiellonka, princess of Hungary and Holy Roman Empress, was their great-great-great-great-granddaughter, and other descendants included all the kings of France from Louis XIII onwards, kings of Spain, kings and queens of Poland, and Holy Roman Emperors. John was the elder of the two sons of Roger Mortimer and Joan Geneville's daughter Beatrice, who may have been their youngest child (the birth order of the Mortimer children is pretty well impossible to work out), as she was the last to die, in 1383. Beatrice was first married in 1329 when her father was at the height of his power to Edward, son and heir of Edward II's half-brother Thomas of Brotherton, earl of Norfolk, when they were both still children; Edward died in the early 1330s. Beatrice married secondly in about 1334 Sir Thomas Braose or Brewose, a man of considerably lower rank than her first husband (but then, the Mortimers had been punching above their weight with a marriage to a king's son and brother). John Braose was married fairly briefly to Elizabeth Montacute, one of the four daughters of the earl of Salisbury's (d. 1344) brother Edward and Thomas of Brotherton's younger daughter Alice - who was tragically beaten up by her husband so badly in the early 1350s she died of her injuries - so there was still clearly a connection between the families. Elizabeth died as a teenager in 1361, and as far as I know John did not remarry and died childless. I don't know how, if at all, this Braose/Brewose family is related to the more famous one of the same name, including the William de Braose hanged by Llywelyn in 1230. Maud was yet another of the children of Katherine Mortimer and Thomas Beauchamp, earl of Warwick. She married Roger, Lord Clifford, who was born on 10 July 1333 as the son of Isabel Berkeley (d. 1362), sister of Thomas, Lord Berkeley, and of Robert, Lord Clifford (1305-1344), whose brother Roger, Lord Clifford was executed by Edward II in 1322. Roger, the one Maud Beauchamp married, was the grandson of Robert, Lord Clifford killed at Bannockburn. Roger and Maud's eldest son, who died in August 1391, was called Thomas - another name finally, hallelujah - their grandson John was killed at the siege of Meaux in 1422, and their great-great-grandson John Clifford is infamous for killing Edmund, earl of Rutland, brother of the future Edward IV, after the battle of Wakefield in December 1460. John was the son of John, Lord Charlton (d. 1360) and Maud Mortimer. His paternal grandfather, also John Charlton, was Edward II's chamberlain before Hugh Despenser the Younger; his paternal grandmother Hawise Gadarn was heir to the lordship of Powys. John married Joan Stafford, one of the daughters of Ralph Stafford, earl of Stafford and Margaret Audley, and they had two sons: the elder, John, was born on 25 April 1362 and married Alice, daughter of Richard Fitzalan, earl of Arundel, but died childless in October 1401; the second, Edward, was born in about 1371 and married Eleanor Holland, daughter of Richard II's half-brother Thomas Holland and another Alice Fitzalan, the aunt of the one who married Edward's elder brother. Eleanor Holland was the widow of Roger Mortimer, fourth earl of March, died 1398, namesake grandson of the second earl of March. Joan was the only daughter of Margaret Mortimer and Thomas, Lord Berkeley, and the sister of Maurice, Lord Berkeley above. Before 26 July 1337, when they were both children, she married Thomas, son of the well-known Despenser adherent Sir John Haudlo and his second wife Maud Burnell; her brother Maurice married Elizabeth Despenser the following year, their father Thomas evidently keen to heal the divisions of Edward II's reign. Sadly Thomas was dead within two years of the wedding, leaving Joan a widow when she can't have been more than about ten and maybe have been considerably less. In 1343 when she was at most fourteen, she married Sir Reginald Cobham, who was born in 1295 and was thus the same age as her father. Joan and Reginald had a son and a daughter, their son, inevitably named Reginald, marrying Eleanor Maltravers, granddaughter and heir of John Maltravers and the widow of Sir John Arundel, marshal of England. Reginald and Eleanor had a son Reginald, the father of Eleanor Cobham, who married Henry V's brother Humphrey, duke of Gloucester. Joan's mother was Roger Mortimer and Joan Geneville's daughter Joan, and her father was James, Lord Audley, who was born on 8 January 1313 as the son of Nicholas Audley and Joan Martin, dowager countess of Lincoln (the stepmother, though she was probably a decade or so Alice's junior, of Alice de Lacy). Joan married John Tuchet of Markeaton in Derbyshire, who was born on 25 July 1327 as the son of Thomas and Joan Tuchet, of whom I know nothing. John Tuchet and Joan Audley's son John Tuchet, born in about 1347 or 1350, may have been the eldest great-grandchild of Roger Mortimer and Joan Geneville (the only others I can think of who may have been older were the daughters of Maurice Berkeley and Elizabeth Despenser), and was killed in a naval battle off La Rochelle in 1372. Kathryn, I am full of admiration to your meticulous research. Blanche's effigy is truly a masterpiece. She seems so calm and quiet. I almost envy her, for she looks as if she truly had made her peace with people, God, and her own mortality. Perhaps not so great an achievement in the 14th century, but certainly quite an accomplishment nowadays. IMHO, of course. 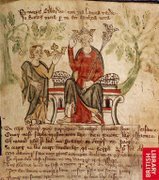 As for Ian Mortimer's works, I added his Edward III to my TBR list some time ago, after reading his Time Traveller's Guide to Medieval England. The latter one is not only brilliantly written, but also entertaining and abundant in useful info. One of the best books concerning MA I have ever read. Thanks so much for the kind words, Kasia! So glad you liked the post. Blanche's effigy is so beautiful; I could look at it for hours. Astonishing work, and yes, she looks so serene. Chock-full of information, as ever! P.S. Forgive me my curiosity (I'm curious by nature) but what is Ian Mortimer like? Judging by the Guide and the opening lines of his Edward III he must be an extraordinary man with great sense of humour and flair for "adventurous". Haha, I love B.S. and A.S.! ;-) I can divide my life into B.E. and A.E., Before and After Edward ;-). That's so sweet, thank you! I could say that my "real" life started ten years ago with meeting Henry the Young King at his mother's court in Alienore of Aquitaine by Regine Pernoud, but the truth is that there would be no Young Henry's website without Sharon and Emilie Laforge. They both encouraged me- unconsciously but still- to try to do something for forgotten Young King. Ah, that's great to hear! 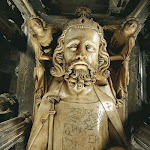 I did an essay on Edward II at university, but it was some years later that the obsession started, in 2004 in fact, and I started the blog in December 2005. I had trouble leaving a comment on Kasia's blog as well. And I find the word identification really difficult as well. I need glasses - seriously! Thanks, Kathryn. I was just going to write the same, but did not know how to put it :-) My poor neglected children! ymollocymollocYou erudition and research skills never fail to amaze me, Kstherine. Many thanks for another excellent post! Yes, a name like Reinbrun is worth remembering :-) I wonder where it came from - was it a name from way back in one of the parents' families, or just something they liked the sound of? oh, posted 2 comments here and they are not showing. Hmm - where did I go wrong then? Anerje, sorry about that - I have comment moderation on and have been out all day and also yesterday evening so couldn't approve them before. :( I hate word verif, but as soon as I turn it off I get inundated with spam. I wish there was some way of pre-approving some commenters (maybe there is and I haven't found it yet...;) Thanks, glad you liked the post! Yes, Margaret was always called 'countess of Cornwall' throughout Ed's reign. Satima, thanks so much! So glad you liked the post - I did think of you actually as I was writing it, as I know you love and are really knowledgeable about genealogy! Carla, I have a feeling it was the name of a legendary character from a story or a poem, one based in or around Warwick - must check that actually! Blogger is being naughty - it wouldn't let me post on my own blog! Just been watching a programme on Berkely castle on BBC - count to 10 Kathryn - the red hot poker, that's all I'm saying! Brilliant article Kathryn. Are the Berkeley's that are mentioned the family that owned Berkeley Castle ? Thank you, Jayne! Yes, that's the family. Christopher Marlowe lived and wrote in the times when playwrights needed to produce works only compared to today's Hollywood productions. Nothing more, nothing less. At least this is how I see it. As for me, I always try to learn all available versions of the events. It's difficult, but necessary. I wish you could have seen me when I'd been reading all those chronicles unfriendly- to put it gently- towards Henry the Young King. Anyway, I'm going to post a few words about both, friends and foes of Henry in December. Strange as it may seem, but in his lifetime he seemed to have only friends, no foes. He was the only member of the family popular in his lifetime. Hi again Kasia! Yes, that's an excellent point about Marlowe. And very interesting about Henry and his friends, and his popularity. Wow, good for him! Kathryn, it appears that Reinbrun was a Romance of the Middle Ages, and that his character was the son of another Romantic hero, Guy of Warwick. Also, of interest, Wikipedia claims that Thomas Beauchamp's father, Guy de Beauchamp, was named after Guy of Warwick. I don't know if you trust Wikipedia on this...still, it would be interesting if Guy's grandchild was named after the same Romance that he was named after! It would show that the Beauchamps were great lovers of literature, anyway. That's great, thanks for the info, Karacherith! I do seem to remember reading about Guy being named Guy of Warwick, and it makes sense, if Reinbrun was the son of the hero, that Thomas and Katherine would have chosen it for their own son. Guy, who died in 1315, was an interesting character: brutal but also intelligent, pious and cultured, and he left a large manuscript collection to an abbey (which one escapes me now - I must check). Great post, as usual. Edward III restored the earldom to Mortimer's son and let Mortimer's grandson marry into the royal family ... sounds to me like Edward III wasn't all that convinced that Mortimer killed his father. Thanks, Esther! Great point - Edward III's behaviour in general towards the men accused of his father's murder, with the exception of Thomas Gurney, is pretty odd unless he wasn't convinced of their guilt. Chroniclers always get their quills in a twist when a king so much as talks to non nobles. ;) Heinrich (Henry) IV of Germany got a lot of that because he picked his advisors among the lower nobility - the ministeriales - or even further down the social ladder instead of the counts and dukes he was supposed to pick. Though one can't blame him, several of those counts and dukes and at least one archbishop were involved in a - successful - plot to abduct him as child. I would not have trusted those men either. It shows how 'unpopular' my blog is (not many comments) that I didn't get any more spam after I switched the verification off than I did before. Ah, I didn't know that about Heinrich, Gabriele - really interesting! Sorry about the word verif. :( It always takes me at least two, sometimes four or five attempts to get it right on other blogs too. It wasn't the nasty troll, but I suddenly got inundated with spam. So it's either no anonymous comments or word verification. Since I've used the first protection for years, I'll stick to that rather than the wiggly lines. It's Open ID after all, so you don't need a Blogger blog, just some place, Wordpressw, LifeJournal or whatever. Hello everyone! If you are interested in Henry the Young King's younger brother, Richard the Lionheart and his stormy career as the Duke of Aquitaine and King of England feel free to visit my blog. My friend Richard was so kind and let me post his text concerning his namesake and favourite of the unruly sons of Henry II and Eleanor of Aquitaine.